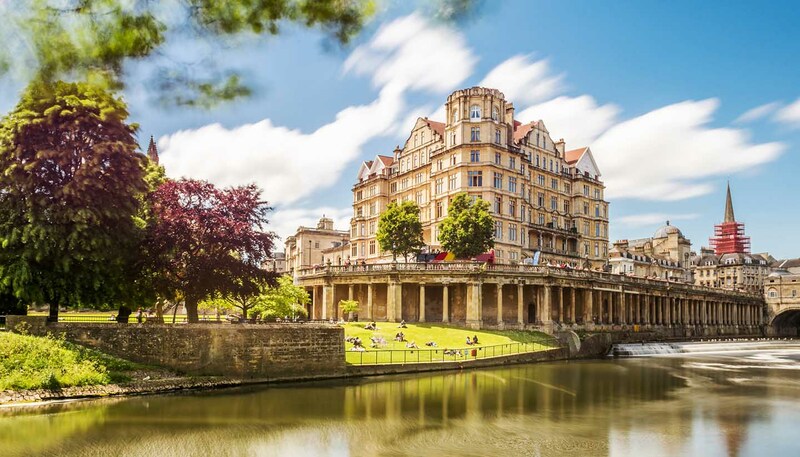 A honey-coloured gem set in the leafy south-west of England; Bath is one of the UK’s most idyllic cities. The centre is characterised by sweeping crescents and twisting streets glimmering with golden stone, and calls to mind scenes of 19th-century high society as described by Jane Austen in two of her novels. There’s also plenty of greenery and a gentle bucolic pace thanks to the city’s position amidst soft English countryside. Bath is famed for its thermal springs, around which the Romans built a magnificent temple and bathing complex, which gave the city its name. The site still flows with natural hot water, while today’s ready supply of top-end boutiques and fine dining compliment the 21st-century thermal bath and spa facilities, pushing the city’s appeal to an all-time high. Bath has the further distinction of being the UK’s only entire city with UNESCO World Heritage status. Around 5,000 buildings are listed for their architectural merit, with the Royal Crescent, the Circus, the Pump Room, the Assembly Rooms and Pulteney Bridge particularly exceptional Georgian masterpieces. Today, any addition to Bath’s pristine brickwork has to slot in seamlessly and be built in the distinctive Bath Stone. Beyond the city confines, gently undulating hills offer endless rambles, and not a few picture-postcard villages. Bath is within easy reach of some of the Cotswolds’ most appealing offerings, such as the pale 17th-century limestone buildings of the historic wool town of Painswick. As to be expected of any university town, Bath’s pubs fill up swiftly at night, while its culinary circuit is increasingly diverse. Dinner options range from affordable brasserie meals to exquisite contemporary dishes served on crisp white tablecloths. For a real treat try the Michelin-starred restaurant at The Bath Priory. Literary and artistic residents make for a rich cultural scene, and Bath’s calendar is peppered with noteworthy festivals, such as Bath Literature Festival and Bath International Music Festival. As for a certain English novelist, she remains one of the city’s most revered figures – her life and work are celebrated every autumn at Bath’s city-wide 18th-century extravaganza, the Jane Austen Festival.